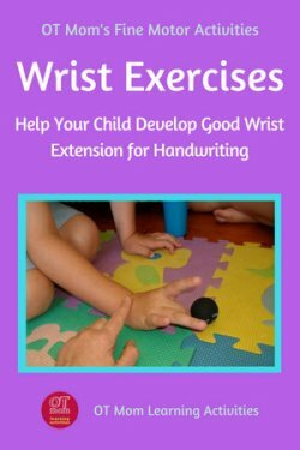 These simple wrist exercises for kids can help stretch and strengthen the wrist muscles and help your child use a good wrist-extended position when writing. 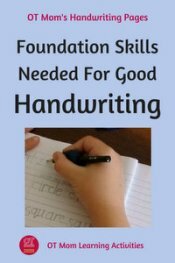 In turn, this may help improve your child’s fine motor skills and have a positive effect on handwriting. Playing a restaurant game will give your child a chance to carry a tray on an outstretched hand. Use a toy tray and toy cups and have your child serve you "tea"! Start with very lightweight toys and gradually increase the weight as your child’s wrist strengthens and the muscles stretch – for example filling the cups with water, or adding a light book to the tray. Try some fun gross motor exercises such as pushing games or crab walking that stretch the wrist muscles automatically (see this page of shoulder exercises for kids to see the different pushing games). 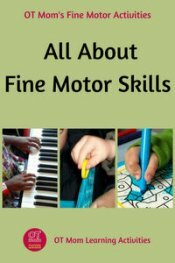 As a bonus, strengthening the shoulder muscles with these games will also enable your child to use the hand and finger muscles more effectively. Crawling / creeping is a great activity to help strengthen shoulder muscles, develop bilateral coordination, and as a bonus, it can help stretch out tight wrist muscles! Have your child crawl (or creep, if you are in the US!) under chairs, through a tunnel, or simply chase you across the grass on all fours! Using a vertical surface can help your child develop a good extended wrist position. These activity ideas are easy to incorporate into a child's day! Whenever coloring or drawing needs to be done, stick the paper to a wall, blackboard, door or other smooth vertical surface. Important: Always check your child's position - if the elbow is held out to the side or if the hand is in line with the elbow, your child won't get good wrist extension - see the pictures below! Elbow held below hand - much better wrist extension! Working on a vertical surface also has a LOT of other benefits, such as strengthening upper body strength, increasing endurance and developing bilateral coordination. So it is worth incorporating these wrist exercises for kids into your child's routine! Some toys naturally lend themselves to needing an extended wrist for playing. Look at the photos below to see how the wrist naturally extends when the hand is resting on the floor and the fingers are used to play the games. This is not usually the natural position that kids use, so they may need some encouragement to rest their wrists on the floor while their fingers play the games. 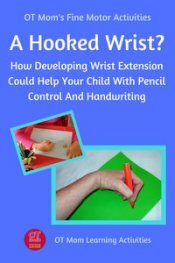 My fine motor e-books contain a host of fine motor information and activities, including these wrist exercises for kids - check them out! 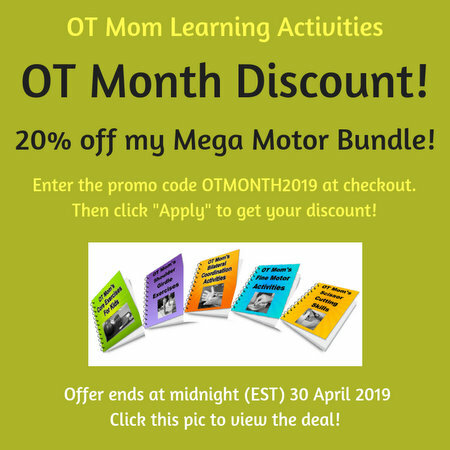 I have used my affiliate links to link to the resources below. If you purchase something through my links, I will receive a small commission which helps to keep this site running. However, you are under no obligation to purchase anything! Amazon stock a range of rubbing plates like the ones alongside. Stick them on the vertical surface and then stick the paper over the top. Have your child rub over them using a crayon held on its side so the flat edge of the crayon brings out the picture or pattern. You can also find a range of whiteboards and easels at Amazon, to give your child a good vertical surface to work on. Some children benefit from working on a slanted surface, which helps get the wrist and hand into a more functional position. You can try a slanted board from PFOT (this is my affiliate link to a page of writing helps) or you can turn a ring binder file sideways and use a clip to hold the paper. Please sign up for my occasional newsletter to receive updates when new pages are added!